When rumors began spreading late on Monday about a possible Hamas-Israel ceasefire brokered by Egypt, Ismail Haniyeh - the top Hamas leader in Gaza - appeared on a pre-recorded TV interview from an unknown location to address Palestinians. In the video, Haniyeh's message was clear - he wanted to reassure Gazans that he and Hamas were unwilling to compromise on the innocent blood spilled in Gaza during the last nine days. “It is not possible for any party to bypass the conditions set by Palestinian Resistance to implement a period of calm” he said in the clip. Hamas have since said says the ceasefire draft wasn’t seen by then until after it was made public, suggesting to them that the ceasefire proposal was more a media ploy rather than a true political initiative to end the conflict. “We want to stop the aggression on our people, but the problem is the realities of Gaza such as the starvation siege, closure of borders, the humiliation of people”, Haniyeh said. There appears to have been a consensus between Hamas and the Al-Qassam Brigades, its military wing, on the Egyptian proposal. Al-Qassam gave a press statement on Tuesday at 4 am saying it "was not worth the ink it was written with". Al-Qassam dismissed any talk of a ceasefire, saying its battle with "the enemy" will "increase in ferocity and intensity." All Palestinian factions appear to agree on the ceasefire conditions they would accept: A lifting of the siege on Gaza, prisoner releases, an end to Israeli attacks and a halt to any Israeli disruption of plans for a Palestinian unity government. Khaled Al Batsh, the senior leader of Islamic Jihad on Tuesday told reporters in Gaza City that there was nothing new in his group's position, although he added that his movement appreciates the role Egypt plays. “As far as calming down, there has been communications, but it has not reached the desired level. Initiatives should not come through media, but through the known channels of communications of the factions and resistance leaders”. The Palestinian Resistance Committee's position is the same as Hamas, with spokesman Abu Mujahed telling journalists, “We have not received any initiative, and for us there is no ceasefire or calming measures”. Under the Egyptian proposal, hostilities would "de-escalate" at 9am (06.00am GMT) before a full ceasefire 12 hours later if all parties agreed. However, Israeli air strikes continued in different parts of Gaza. The first targeted a residential tower in Sheikh Zayed, leaving four people injured, according to medical sources. Later at noon, Tuesday, several airstrikes continued in different parts in Gaza, the heaviest hit was west Gaza City, and Asda entertainment city, in Khan Yunis. At time of press the death toll stood at 193 killed and 1,400 injured over the past nine days of attacks - the UN has estimated that 77% of these are civilians. It is likely that communication channels are established between the Resistance leaders and Egyptian Intelligence and, it is only through these that Hamas could convince Islamic Jihad and Palestinian Resistance Committee to accept an offer. However, it does not appear that any of the three parties is willing to compromise on the conditions agreed upon by the Palestinian Resistance factions. 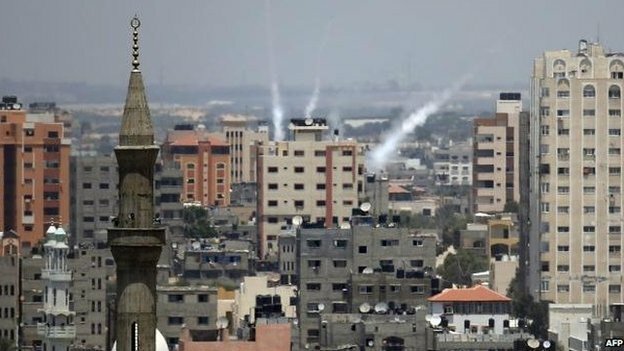 Israeli intelligence on Tuesday had started to call using pre-recorded announcement on hundreds of Gaza land phones, asking Palestinians in Gaza to pressure Hamas to accept a ceasefire, say locals to MEE in Gaza City. Still, political analyst Dr Mukhair Abu Sada of Al Azhar University is optimistic that the coming hours will see some form of ceasefire. “I don’t think Hamas can say no to an Egyptian initiative” he says. Adding “I estimate that they will have some reservations concerning ending the siege and release of prisoners”. “Saying no to Egypt will put Hamas in political isolation - it’s true they feel ignored and humiliated that no one talked to them”, he adds to MEE. Dr Mussa Abu Marzouq, deputy chief of Hamas, wrote on his Facebook page earlier this afternoon that the proposal was still being studied. It seems that he has been approached as the entry point for Hamas leadership, based in Cairo. Yet, some Palestinians reject accepting the proposal. London-based political analyst, Dr Ibrahim Hamami condemned the statement by Dr Abu Marzouq. “Those who say Dr Abu Marzouq is forced to make such statements, and that’s politics. No sir, it’s better he keeps silent and politics that offer compliments on blood are not needed”, he says. The coming hours will be critical; whether ceasefire kicks in with the conditions of Hamas and resistance factions, or the continuation of a deadly war. Israeli threats of a ground invasion are dominating talk on Gaza’s streets. However, the Al-Qassam Brigades remain defiant in the face of the prospect: “we can’t wait for that, as this is the only option to liberate our Palestinian prisoners”, the group said in a statement.